As the famous saying goes: "Birds of the same feather, flock together." Simply put, it's truly human nature for us to gravitate towards people who share the same ideals, belief and interest as we do. That is why Paul and I love hanging out with our friend D for many, many reasons! One of which is because D is such an amazing foodie and there's never a dull meal time shared with him. The three of us have been travelling in and out of the Lion City for the past 3-4 months for work and leisure so before anyone flies off again (that would be D who flew off the day after we met..), we agreed to meet up for dinner. Just like me, D keeps a running list of restaurants that he wants to try in Singapore. Lately, we both have been so intrigued about the newly opened Korean restaurant called Masizzim (pronounced as masi-jim)which is known for serving really good Korean stew. Being a new and popular restaurant means just one thing. Expect to wait in line for some time before finally securing a table. We got there a few minutes past 7 and forever the early bird, D, was already in the queue for about 15 minutes. It was a good thing that we were quickly ushered in towards our small booth minutes after Paul and I arrived. Massizim has a very strong Korean vibe where you're still given a couple of banchans (kimchi, pickled radish and fresh garden salad) right after you've settled into your seat. Complimentary drinking water are served in plastic Lock & Lock water bottles and the utensils are definitely very Korean too. It has a more modern take though with the KPop music videos playing on the screens. The menu was very straight-forward and simple. 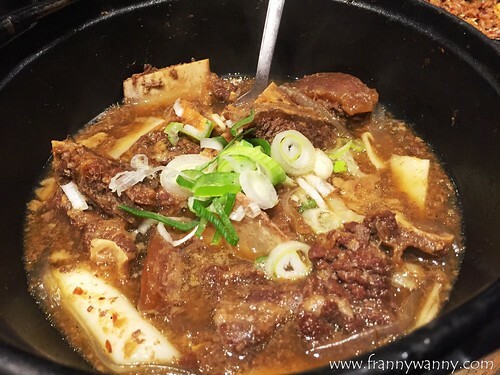 There are 3 kinds of stews (beef, pork and chicken) and you can choose whether you want it in soy broth (for beef or pork only) or spicy soup. After this, you choose your noodles -- glass noodles or udon? 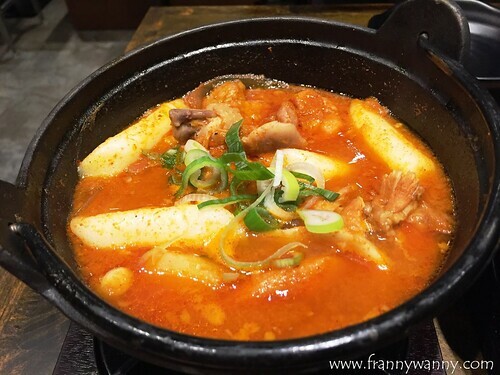 Now, for those who would go for the spicy soup, it's time to decide on your preferred spicy level and what other add-ons you'd like to have in it (cheese, toppoki rice cakes or more noodles). Given this, there'll be numerous variations that you can come up with for your very own stew. For us though, we decided to go with the classic Galbi Jim style so that would be Soy-based Korean Beef Stew with Glass Noodles. Since there were 3 of us, we got the Double serving (S$32) which comes with two bowls of rice. I have to say that this is one of the best Beef Stews that I've had here in Singapore. The meat literally falls off the bone and we simply pick it up using our chopsticks and soup spoons. The sauce had a nice sweet-salty flavor that makes it really addicting. The glass noodles were not the usual vermicelli type and instead they went with the flat hofan-like kind. This was just perfect and I'm so glad we ordered this. 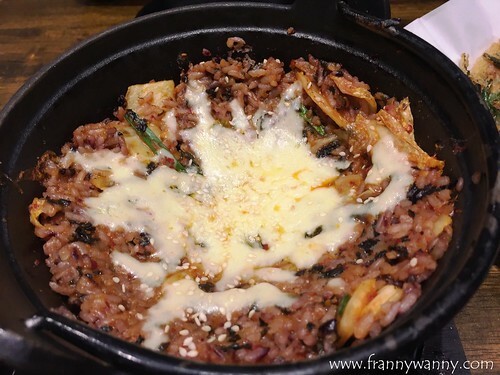 As for the rice, we wanted to try the Kimchi Rice which they allowed to upgrade for only additional S$6. My goodness! It was fiery hot! The men took care of this as I quickly pushed this away after one small bite as my poor tastebuds went on fire. One bowl of rice comes with the single serving stew so we upgraded that to Spicy Cheese Fried Rice. Just like the Kimchi Rice, this one was just as spicy and the cheese wasn't of much help at all. 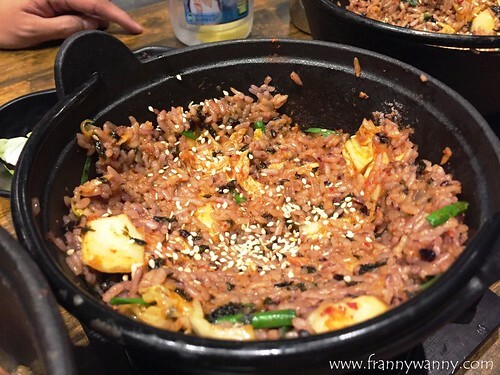 If you're a fan of spicy food and kimchi then do try this! 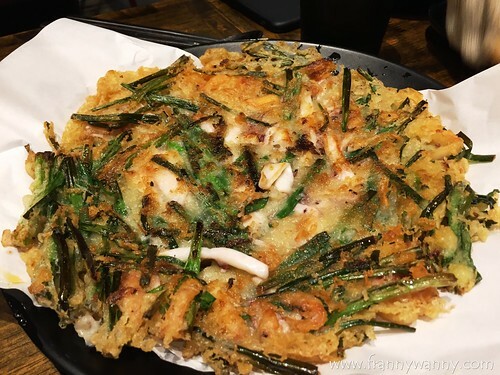 Lastly, Paul and I are big fans of Korean Pancakes called Pajeon so we suggested to order the Squid and Leek Pancakes (S$14) which was looking so good on the menu. I have to say though that on the first few bites, the pajeon was really yummy! Crunchy with a generous amount of fillings, it was love at first bite. However, after a while, the oil started coming out and each bite was just too greasy to be enjoyed. The trick here is to either eat it really fast or ask for extra oil blotting paper. Over-all, we really enjoyed our first visit to Masizzim and we'll surely be back for more of the Beef Stew! Next time though, we're stick to the regular brown rice and no more spicy rice too. Till next time! Masizzim is located at 313 Somerset, B3-02, 313 Orchard Road, Singapore. Unfortunately we do not take reservations so I highly recommend for you to go early especially for dinner and during weekends.